Raw cotton was America’s most valuable export. It was grown and picked by black slaves. So Mr Baptist, an historian at Cornell University, is not being especially contentious when he says that America owed much of its early growth to the foreign exchange, cheaper raw materials and expanding markets provided by a slave-produced commodity. But he overstates his case when he dismisses “the traditional explanations” for America’s success: its individualistic culture, Puritanism, the lure of open land and high wages, Yankee ingenuity and government policies. I’ve italicised the part which incited the outrage, but the final sentence is apparently the real howler in the eyes of the offended. I’m more interested in the economics of the above claims. I haven’t read this just-published book, so I can only go by the review, and as far as I can tell neither Baptist nor the offended have disputed the reviewer’s characterisation of the book’s thesis. The Economist‘s elf was lazily speculating, a priori, about what could have been the determinants of efficiency in southern cotton production. It’s possible the reviewer is familiar with some of the arguments and debates surrounding Time on the Cross : The Economics of American Slavery, one of whose many controversial arguments was that slaves were becoming ever more valuable property in the antebellum American South and were therefore better treated than commonly supposed. [Edit : Fogel restrictively argued, “The material (not psychological) conditions of slaves compared favourably with those free industrial workers”.] But I doubt that literature is known to the reviewer, because then he would have been familiar with recent research on the sources of increased efficiency of cotton agriculture in 1800-60. Standard accounts treat the technology of cotton production as static following the invention and refinement of Eli Whitney’s 1793 saw gin. Given that cotton cultivation remained a hand labor task throughout the slavery period and that no machines comparable to the reaper gained acceptance, this view seems plausible at first glance. All early attempts to develop mechanical cotton harvesters failed. The stereotype of an “uninventive South” is reinforced by the region’s low level of patenting activity. Implicit in this treatment is the assumption that all Upland cotton was alike. But cotton was not cotton. 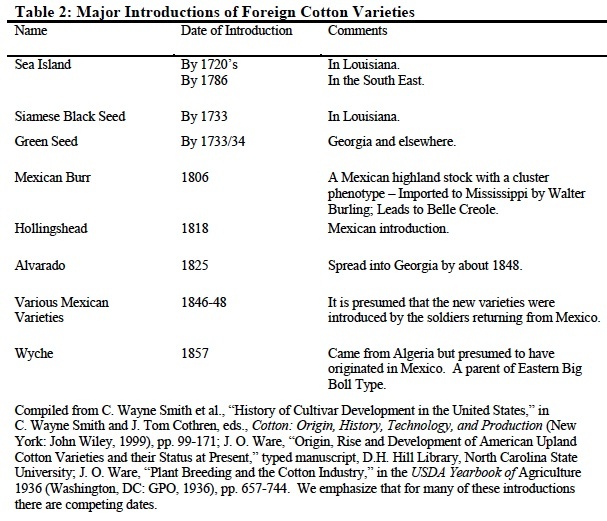 The qualitative accounts of planter-historian B. C. L. Wailes, agronomist J. O. Ware, historian John Hebron Moore, and others, asserted that southern planters created superior cotton varieties that significantly increased cotton yields, fiber quality, and the amount of cotton that could be picked in a day. 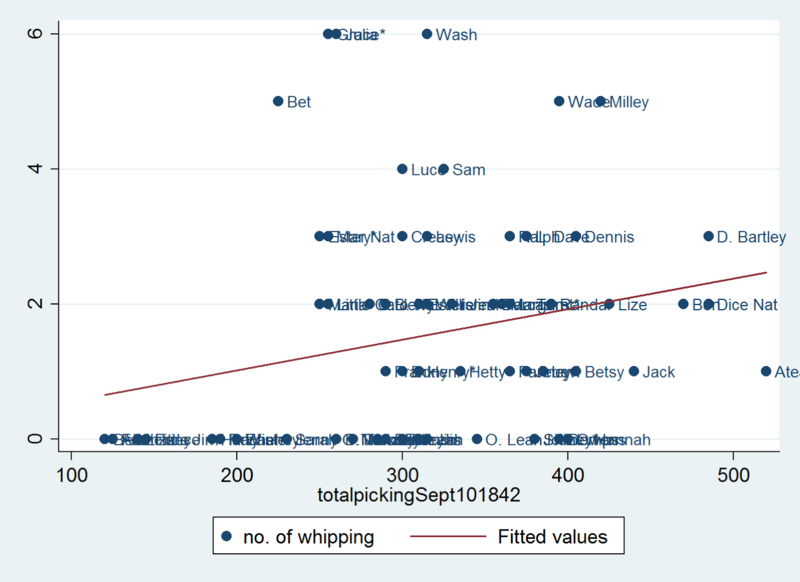 The surviving archival records of 142 plantations allow us to construct a panel dataset including 509 crop years and 704,800 daily observations of the cotton production activities of 6,200 individual enslaved African Americans. The data clearly document the revolution in cotton picking efficiency—between 1801 and 1862 the average amount of cotton picked per slave in a day quadrupled. This rapid growth in picking efficiency—2.3 percent per annum—was substantially faster than the advance in labor productivity in the overall economy. …Contemporaries, and many historians, viewed the introduction and improvement of large-boll cottons from Mexico as a revolutionary innovation that rivaled the importance of Whitney’s gin. We follow this lead by analyzing the creation and diffusion of Upland cotton varieties. Next, we introduce a new dataset drawn from the archival records of 142 plantations. These data show that the amount of Upland cotton the typical slave picked in a day increased approximately four times in the 60 years preceding the Civil War. We go on to explore a number of hypotheses for the increase in picking efficiency, concluding that improved cotton varieties likely accounted for most of the change. We further argue that our measured increase in picking efficiency captures only part of the impact of biological innovation on cotton production because the new varieties also offered higher yields and rendered higher quality fiber than most earlier cottons. In short, cotton output grew significantly faster than labour inputs, i.e., slave labour productivity was rising quite steadily. The bottom of the table displays the market prices of cotton and slaves, which serve as a check on the productivity observation. Cotton prices were falling but a major input in the production process, slaves, was getting more expensive. This fact is strongly consistent with rising labour productivity. Personally I can’t believe 2.3% per annum growth in productivity over 60 years could possibly be achieved by something other than major technological change. 2.3% per year is huge. To put that in perspective, consider that output per worker in English arable agriculture rose ~1% per year in the period 1800-1850. [See Table 15, Broadberry et al.] Or consider Olmstead & Rhode’s claim (page 35) that the mechanical reaper increased the productivity of wheat harvest by 50-100%. That is puny compared with the quantum leap in cotton picking productivity : 2.3% over 60 years amounts to almost 400%. How the hell does one achieve a quadrupling of output per worker just by increased effort alone, no matter how coercively obtained ??? Staple length in this mallow is everything. The difference between inch-long medium-length G. hirsutum fibers and those of G. barbadense, which reach two inches, is the difference between perfectly drinkable table wine and a celestial Chateau Lafite-Rothschild. By that standard, the Old World’s short-staple cottons represent jug brands—inferior by any measure. Once their bolls open, spiraling cotton fibers twist back and forth, interlink, and cling to one another, which greatly facilitates the spinning process. But short fibers—under an inch in length—easily break apart; they also hold less moisture and tend to be more brittle, producing coarser fabric. The Mayans and the Bahamian Arawaks that Columbus encountered were growing and spinning the two New World cotton species. Unlike their weaker Old World cousins, hirsutum and the elegant barbadense are botanical warriors and belong to a special type of hybrid called a tetraploid, meaning simply that all of the genetic structures of both parents are carried within the offspring—an unusual occurrence (most often only some of each genome shows up). As a result of their industrial-strength DNA, these tetraploids prove to be especially tough, successful, vigorous plants. They produce the hundreds of thousands of airy yet sturdy tubular cellulose fibers that lend themselves to textiles strong enough to withstand the abuses of human wear and tear. Yafa further notes that “green-seeded upland would become the one that blanketed the American South” ; and today “it accounts for about 95 percent of all the cotton grown and used around the world”. Olmstead and Rhode devote several pages to the trial-and-error process by which various cultivars of G. hirsutum were carefully selected, hybridised (especially with a Mexican cultivar), and adapted to the soil and climactic conditions of the American south. (A more detailed literary account, full of observations by contemporaries on the importance of new cotton varieties, is found here.) They also document the failure of another promising cotton species G. barbadense, also known as “Sea Island cotton”, to take hold on account of its low yield. For me the vastness of the efficiency gain alone speaks eloquently to some other factor besides ekeing more labour out of slaves until the pips squeaked. O & R nonetheless go through the motions and address the obvious alternate hypotheses for the increase in the cotton pick rate : (1) efficiencies of scale from the slave gang system ; (2) better management (including the possibility that slave owners are getting better at squeezing work out of slaves) ; and (3) the expansion of cotton production into western territories of the United States. Note that the Y-axis has got a log-scale ; the differences in the growth of pounds picked per worker-day of the two cultivars are colossal. In view of the above, it’s difficult to believe the euphemistic “managerial efficiency” was driving the secular rise in the pick rate of Upland cotton. O & R also checked the improvements in yield on the same plantations over time before and after they switched from Sea Island to Upland. Unfortunately they produce no time series graphics for these observations, but they report large increases over time in the samples of plantations covered. Finally, the botanical-genetic-technological explanation of the efficiency gains in US cotton production better accounts for the dramatic conquest of the world market for raw cotton by growers of the American south toward the mid-19th century. American cotton had 80% of the world share. Why didn’t this new American technology get diffused earlier and faster ? The Upland cultivar was adapted to the geoclimactic conditions of the American south and could not be rapidly adapted by the other primary cotton-growing regions of the world, such as India, Egypt or the Caribbean. Britain, the premier producer and exporter of cotton textiles, directly controlled many of these regions, but its manufacturers chose to import primarily American cotton. So, YES, The Economist was quite fatuous and grossly ignorant in tendering the flaccid hypothesis that slaves might have been better treated, as a first-order counterargument to the claim that slaves were driven ever harder. But it was perfectly reasonable in doubting the latter claim in the first place. At his blog the political scientist Chris Blattman rightly chides The Economist for not bothering to know the literature on the subject. (His post has been reblogged at the The Washington Post.) 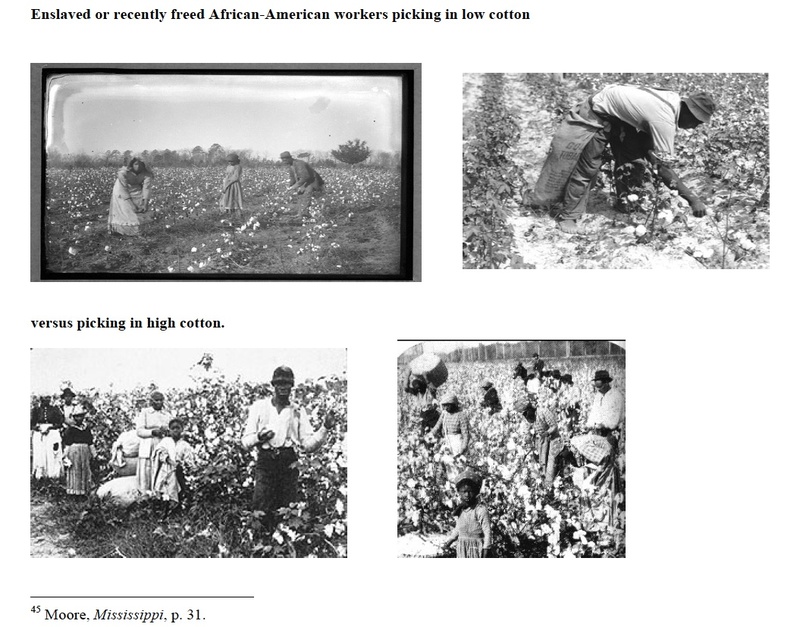 But then instead of getting to the heart of the matter — the efficiency of antebellum cotton agriculture — Blattman digresses about the literature on the efficacy and effects of coerced labour, with one link and graphic after another proving…. definitely not that an intensified effort at coercion of labour can quadruple worker output over six decades in a very labour-intensive production system. On Twitter Blattman uttered to me the truism that “technology and (coerced) labour are complements”, as though no one has ever before decomposed the sources of economic growth into labour inputs, capital inputs, technological change, etc. The complementarity is beside the point. The point is that driving slaves harder, alone, could not possibly have accounted for the massive productivity gain in cotton. PS — There were also some technological improvements in cotton agriculture unrelated to plant breeds that contributed to the efficiency of cotton production. Two most important are “scrapers” and machine seeders. But I do not stress those here. Also, the better soils of the more westerly lands in the “New South” were important. “…were largely mixed populations with varying amounts of cross-pollination and heterozygosity that gave them plasticity and potential for genetic change. They were tropical in origin, perennial, photoperiod-sensitive, and did not flower under the long days of the United States Cotton Belt. Yet, following generations of repeated selection, these initial stocks were molded into early maturing, photoperiod-insensitive cultivars adapted for production in the southern United States Cotton Belt. “Initial attempts to grow upland cotton in the areas that now constitute the United States faced severe difficulties. Success depended on finding a mutation/cross or introducing a variety with the appropriate photosensitivity characteristics. The varieties eventually prevailing in the United States typically flowered in early to mid-summer and began to reach maturity by the end of August or early September. O&R 2007 goes into some detail on the plant-breeding aspect of the cotton cultivars. There’s definitely much more to it than just Petit Gulf. This entry was posted in cotton, Edward Baptist, historians of capitalism, Slavery, The Half has never been told and tagged cotton, cotton picking, Edward Baptist, historians of capitalism, slave productivity, Slavery, The Half has never been told. Bookmark the permalink. I don’t know if the first sentence is true (can any one confirm that figure?) but the second is patently true because 1) the long-staple variety of cotton was widely planted, 2) use of the cotton gin displaced separating by hand, and 3) more slaves were occupied in cotton production rather than in the 18th century Old South cash crops of indigo, rice and tobacco. Sure there’d be a dramatic increase in cotton production. Cotton had long been grown in South Carolina, but only on the islands between Charleston and Savannah, where the “long-staple” variety of the plant did well, staple being the fiber or wool in the boll. This premium strain would not grow in the rolling piedmont of the upstate, where only “short-staple” cotton, with its coarser, shorter fiber, thrived. Short-staple cotton required never-ending handwork to clean, because its fibers clung to the seed more firmly than those of the long-staple variety, so the more common cotton did not catch on – that is until the invention of the cotton gin (patented 1794). Eli Whitney’s cotton gin, with its revolving cylinder lined by teeth, pulled the seed from the raw fiber, and made the piedmont cotton profitable. some three hundred thousand black people, who were walked in coffles as far as Arkansas, New Orleans arose as the South’s premier city (displacing Charleston)” (ibid., p. 302). This transfer of slave labor was huge and to serve what became King Cotton. The 1st claim is understated. The paper by Olmstead & Rhode says the average slave in 1860 picked 4 times as much cotton as in 1800. That, after all, is the whole point of this blog post. But the fortune of slave labour productivity over time is a fairly new area of research. Previously all the controversy had been about the relative productivity of free versus slave labour (cf Time on the Cross and the subsequent vast literature spawned in response to it). > Personally I can’t believe 2.3% per annum growth in productivity over 60 years could possibly be achieved by something other than major technological change. I agree, and the “beating the slaves harder” is ludicrous on the face of it. On October 1 a total of 112,400 Soviet POWs were working in Germany. What were the working conditions for these men? The following account by the district leader (Landrat) of Diepholz, an area where more than 3,000 prisoners from Wietzendorf were used for reclaiming marshlands, is typical. The Russian prisoners arrived in a very starved state. Their physical condition was so bad that I doubted they could carry even a shovel, not to mention do hard work in the marshes for ten hours a day. . . . Already on the second day of work a Russian died at work from exhaustion. Attached are two photographs showing how the Russians eat grass like cows. . . . To raise the miserable productivity levels, the civil foremen and the military guards often have beaten the men. Such brutal treatment, however, showed no results. The productivity levels of Soviet prisoners were only 10–20 percent of those of French prisoners who had worked there before, and the district leader urgently recommended increasing their rations. According to the assessment of employers and the Labor Administration after just two months, the successful use of Soviet labor depended on feeding the prisoners at a reasonable level. A small payment to Soviet POWs, intended to cover the cost of providing for their basic needs, was also implemented. Thus the worth of the Soviet slave workers had increased, and the German government began to show interest in their survival and fitness for work. This is the Nazis and Adolf Hitler! Are we really to believe Southern slave owners hated their slaves and wished them ill as much as the Nazis did the Russians–their ideological and racial mortal enemies? Yet even the Nazis softened their treatment of forced labor to increase productivity. A slaveowner would likely punish a recalcitrant slave for misbehavior or insubordination, but the relationship was closer to a farmer and a horse or other beast of burden than the Nazis to the Russians. An average farmer does not calibrate the beating of a horse in hopes of making it produce more. In any case, the Nazi-Soviet example shows that human beings–like any other animal–tend to be less productive when actual punishment has to be used (versus merely the threat of punishment). why was the increase relatively regular and continuous, rather than occurring rapidly and tapering off? I think Joey has mixed things up a bit. The idea that the “judicious and careful use of beatings” boosted cotton yield belongs to Baptist (at least according to the Economist review), not to the reviewer. The Economist reviewer preferred to speculate that the scarcity of slaves following the end of the transatlantic trade made them more valuable as capital assets, and better treatment might have led to better slave productivity. Both views hold as a premise that the dramatic gains in slave productivity had something to do with the work effort of slaves. But as I argue in the blogpost that just can not be. So I was refuting both the Economist and Baptist (at least as represented in the review, haven’t read him). But since the critics of the Economist seem to be largely Baptist-friendly, I would have to say my refutation was aimed more at Baptist. When his book comes out on Kindle I will probably read it. Google Books has some excerpts from Edward Baptist’s book. Unless there’s more to it than pp 127-8, it would appear Baptist uses the Olmstead productivity data but merely hints at the cotton-cultivar argument and just waves it away. I mean, there’s more to it than just the Petit Gulf variety of Upland cotton. I would only remove the word genetics from the title ( I know we all love genetics now); it is simply a combination of plant breeding and crop protection. I can bet the seed developers did not even make use of even the basic concepts of “genetics”. Traditional plant breeding is hard work. I had to take a small piece of sandpaper, fold it like a cone, and collect male pollen, and transfer it to the pistil of another plant. The resulting seed produced would be tested for nematode resistance, First in the greenhouse, then in field plots, and then in the field. This process can take 10 years or more to cross plants and produce a new, good variety. In some plants, I made double and triple crosses using paintbrushes and tweezers to transfer pollen from one parent to another parent to combine desirable characteristics of each parent. That was horribly long and mindless work, I had to quit ASAP. One american,Luther Burbank (1849-1926), developed 800 different varieties of fruits and vegetables using classical plant breeding methods. In the 1980’s, the first reverse-orientation copy of an “antisense” gene in a tomato (taking out a gene in the chromosome and putting it back in backwards) which slowed the ripening of the tomato. This tomato was deemed ‘not profitable’ and the project stopped. Today, the GE techniques predominantly involve insect-resistant varieties of cotton and corn, herbicide-tolerant soybean, corn, canola, and alfalfa, and virus-resistant papaya and squash.Almost nothing in common with Plant Breeding. Ironically, the argument that new cotton breeds increased global cotton volume only confirms Baptist’s point, that the pushing system increased productivity. How do you pick the more productive cotton plants? With more efficient pickers and/or more slaves. Baptist’s point was to show how important the pushing system, and torture/coercion, were to the explosion in cotton productivity. Baptist even states this clearly in the book, to paraphrase, “picking was the bottleneck of the entire productive process”. A better analysis would be to look at volume of cotton picked for the particular cultivar of cotton that proved to be more productive in parts of the world where labor was “free” (though this is a stretch for British colonies). If the volume of cotton picked was very similar than this line of thinking may be valid, but as of yet it only confirms Baptist’s argument. Remember, the picking was the sticking point for planters, not the plant breed, this was before industrial agriculture. Unpicked and moldy bolls are not much use to cotton planters in global markets. If the plant becomes more productive than the “worker”, whether animal, machine, or human must follow suit. That issue is addressed in the post “Baptism by Blood Cotton”.